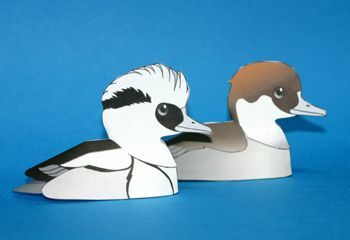 These animal paper models are two Smews, designed by zardoz. The Smew is a species of duck. It is somewhat intermediate between the typical mergansers and the goldeneyes, the only member of the genus Mergellus. Sometimes included in Mergus, this genus is distinct and might actually be closer to the goldeneyes. The Smew has interbred with the Common Goldeneye.